Screenshot from video of the FA. On March 6, 2016, Bryce Viola made the first ascent of Darkside Arete project at Great Barrington, naming it Suspended in Darkness and proposing a grade of V12. Check out Bryce's video below. Bryce has also been cleaning up some V11 repeats at Great Barrington, sending Fantasia and Cubic Zirconia. Lily Canavan looking strong as she wins the Dark Horse final. Photo by Gkwan Photo. Nathaniel Coleman in the finals. Photo by GKwan Photo. On January 23, 2016, Metrorock's Everett facility hosted the Dark Horse 7 Championship round, the culmination of the four event Dark Horse Series. With different winners in each of the prelimary events, the final seemed to be a wide open race for the titles. On the men's side, it seemed to be a preview of the ABS Nationals as several of the top competition boulderers in the U.S. made the trek to Boston for this event. In the end, it was Nathaniel Coleman continuing his hot hand from 2015 beating Daniel Woods and Kai Lightner for the Dark Horse title. On the women's side, local Lily Canavan took a huge step forward by beating Nina Williams and Kyra Condie to take the title on the women's side. Overall, 146 climbers took part in the final event. Click here to check out the full results. Click here for a huge photo gallery from GKwan Photo. Katie Lamb climbing strong for a 2nd place finish. GKwan Photo. On December 19, 2015, Metrorock in Everett, Massachusetts held the third round of the Dark Horse Bouldering Series. As usual, some national talent made the trip to Boston to test themselves against the strong locals. On the women's side, Megan Mascarenas took the top spot over locals Katie Lamb in 2nd, and Lily Canavan in 3rd. For the men it was the 2015 World Cup sensation Nathanial Coleman travelling east to take the top spot with Barth Soloman in 2nd and Jesse Grupper in 3rd. Click here to see the full results. If all the top competitors enter the championship comp on January 23, 2105 at Metrorock Everett, it will pit many of the nation's top boulderers in an epic showdown. Kai Lightner crushing problems for the win. Photo by Garrick Kwan. This past Saturday, November 21, Metrorock held Round 2 of the hugely popular Dark Horse Bouldering Series at the Newburyport facility. On the men's side, Kai Lightner swooped in and took the top spot, while Jesse Grupper (winner of round 1) took second, and Nick Picarella third. On the women's side, Nina Williams came home for a visit and took home first. Bimini Horstmann came in second with Margo Hayes third. On her Facebook page, Nina commented, "my first comp in months and I got first!! ‪ Ultimately the Finals round came down to flashes, and I kept it together for all 4 problems. I didn't feel like the strongest climber that night... but I had a different mentality this time that allowed me to relax and actually have fun. It felt good to get back to that." Click here for the full results. Also, check out the awesome gallery of photos from http://www.gkwanphoto.com/. Round 3 will be on December 19 and the final will be on January 23, both at Metrorock's flagship Everett location. This is a big weekend for plastic pullers, with two premier events on Saturday. Your biggest problem may be choosing which one to attend! On Saturday, November 21, 2015, the first event in the inaugural Tri-State Bouldering Series (TBS) presented by SCARPA and Organic Climbing, The Brawl, is being held at the New Jersey Rock Gym. This is the first of three qualifying comps (#2 at Prime Climb on January 16 and #3 at The Cliffs at Valhalla on February 20) with the final being at The Cliffs at Long Island City on March 11 and 12. For more info, click here to check out their website. Also on Saturday, November 21, 2015, the second stop in the Dark Horse Series is being held at Metrorock's Newburyport gym. Not only is this comp part of the Dark Horse Series it's also a USAC Local bouldering comp. For more info, click here to check out the Dark Horse website. Check back here next week for results and media on these two events. Mike working on The Fly back in the spring. Photograph by Tory Michak. We reported a few weeks back that Mike Foley was close to sending The Fly, 5.14d or V14, at Rumney. Well, on Friday, Mike sealed the deal by sending the extreme crimpfest. Mike commented on Facebook: "Finally put The Fly (14d/V14) to rest! Lots of days and lots of tries. Even linked it into Côte D'Azure (13b) for good measure." The Fly is Mike's 3rd 5.14d. Check out the video below of Kevin Jorgeson's ropeless ascent of The Fly. Sam Enright has done the first ascent of Shadow of the Colossus, V12, formerly referred to as "The Cave Project." On MountainProject.com Sam commented, "All the hand hold are decent, but the feet and body position are strange." and "Hard if you're short, slightly less heinous if you're tall like me (I'm 6 foot 1)." This problem is located in The Swamp boulders area and Brian Nugent posted the following directions on MountainProject: "From Mouthful of Chalk, just walk to around the corner to the right of the problem and look for an opening to the cave formed by the Mouthful boulder as well as 2 or 3 other boulders." Unfortunately, Sam didn't get any photos or video of his send. In the Gunks, Bryce Viola grabbed the second ascent of Extra Bacon, a V12 put up by John Kuphal back in 2011. Bryce commented that this problem was "among the hardest and best in the gunks" and took "the most effort I'd invested into a boulder in a long time." Check out the video of John on the FA. Check out this great video on the first round of the Dark Horse bouldering series in Burlington, Vermont. Round 2 is coming up fast on November 21 in Newburyport. Click here to check out the schedule. Yesterday morning, on a quick visit before work, Mike Foley sent the Rhode Island testpiece, Chelsea Smile, at Lincoln Woods. First sent by Ty Landman in 2009, the problem (formerly known as the Super Project) has only seen two repeats since Landman's FA. Phil Schaal sent it shortly after Landman, as the two had been working it together, and then by Paul Robinson on a quick visit to New England. Landman originally give it a grade of V13 (8B) but, in a blog post for Moon Climbing, also said it could be V14 (8B+). For his part, Foley commented on his 8a scorecard that the problem was probably V14 (8B+): "Finally!!!! A lot of days. For me, this feels like a step up from any other 8B I have every done. I'm hesitant to call it 8B+ but considering how long it took me and that it is exactly my style, 8B+ seems fair." Shortly after Ashima made the 2nd ascent of Nuclear War, Bryce Viola climbed the problem as well. Bryce felt the problem might only be V13 as he has only climbed a few V13s. Bryce also commented that he climbed the problem differently than Ashima and that her way was way harder than his. Check out the video of Bryce's send! Never Been to Hueco. Photo by Justin Sanford. Check out this cool video of Evan Race climbing the FA of at Snowy Mountain near Indian Lake in the Adirondacks of New York. The route, There are No Salamanders in Hueco, V11, is a hard sit start that finishes up the awesome V7, Never Been to Hueco. 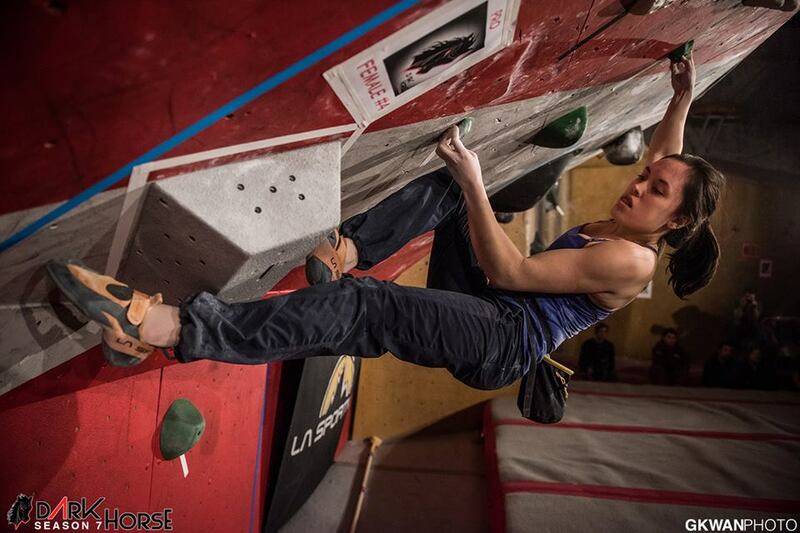 The ever popular Metrorock Dark Horse bouldering series started last weekend with the first stop in Burlington, VT. On the women's side, Kyra Condie took the top spot with Kayla Lieuw in second and Bimini Horstmann in third. On the men's side, Jesse Grupper took home first, with Andy Lamb in second and Shane Messer in third. Click here for the full results. Also, click here to check out huge set of photos by Garrick Kwan. The series continues on November 21 in Newburyport. Ashima Shiraishi has reported on instagram that she has gotten the first repeat of Nuclear War, a Matt Bosley V14 in New York. There had been rumors that this problem may have broken, but apparently it wasn't a broken hold keeping this problem from seeing a 2nd ascent. On the same day, Ashima also sent a V11, Reckless, and a V12, Wetness the Fatness, very quickly. Dan Bates is a Connecticut crusher who has been travelling the world for the last few years. Dan recently visited Oman with Phillippe Ribiere, Read Macadam, and Miguel Willis. This crew found an amazing amount of rock and is putting together a film based on their experience. Check out the trailer for Valley of Giants below. The full series will be out in the fall, click here to check out the website for the latest.